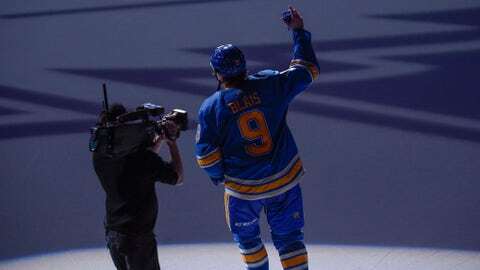 Sammy Blais acknowledges fans after being named the first star of the game following his game-winning shootout goal against Boston on Saturday. ST. LOUIS — In a move that could portend the return of David Perron or Brayden Schenn, the St. Louis Blues assigned forward Sammy Blais to the AHL on Thursday. Blais, who had the game-winning shootout goal Saturday against Boston, was sent to San Antonio on Monday and then quickly recalled Tuesday when Alexander Steen was sick. Blais played in Tuesday’s win over Nashville, providing a memorable hit in the corner on Predators forward Frederick Gaudreau. With Blais, who has three points in 27 games with the Blues and 18 points (eight goals, 10 assists) in 25 games with the Rampage this season, headed back to the minors, it appears that one of St. Louis’ injured veteran forwards could be ready for reinstatement from injured reserve. Perron has been out since Jan. 17 with an upper-body injury that is believed to be a concussion. Perron is fourth on the Blues with 35 points (17 goals, 18 assists) despite missing the team’s last 17 games. Schenn last played Feb. 19 against Toronto, when he suffered an upper-body injury. Schenn is the team’s third-leading scorer with 39 points (11 goals, 28 assists). The Blues visit the Carolina Hurricanes on Friday night.